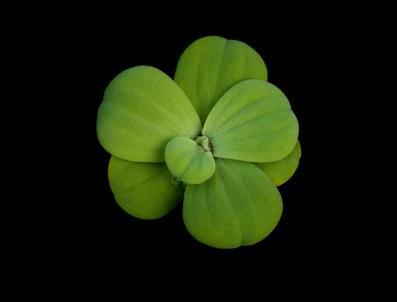 Water lettuce (Pistia stratiotes) are floating aquatic plans grown for their chartreuse green foliage arranged in compact rosettes. Called Nile Cabbage, they belong to the Arum family and consist of a single species. Although originally from Africa, water lettuce is now found in most freshwater bodies in tropical and subtropical areas. Leaves are thick and hairy with parallel veins and scalloped edges. They have no stalks and seem to arise directly from the roots as the stem is highly reduced. The feathery roots grow up to a foot underwater, but the rosettes remain less than six inches in height, forming a low mat over the water surface. Water lettuce flourish in USDA zones 9 - 11. They can be grown in colder climates with adequate protection. The ideal temperature range is 70 - 85 F, but they can survive in temperatures down to 50 F.
They are usually available in garden centers and shops selling aquarium plants. When purchased by mail order, they may not look their best initially. Allow them to recuperate in a small pot in a shady place before adding them to larger arrangements or fish ponds. A few varieties with slight difference in leaf shapes are available, but they all belong to the single species Pistia stratiotes. Ruffles has slightly ruffled leaves as the name implies. Jurassic can grow very large rosettes but growth is slower. Splash has variegated leaves, but is rarer than other varieties. Pistia self-propagate prolifically by making baby plants on the tip of stolons arising from almost every leaf axil. The tiny white flowers arising from the axils of leaves at the center of the rosette have a single bract like the other plants in the Arum family. Each fertilized flower grows into a single berry, but is not usually used for making new plants in cultivation. Pistia can be grown in small pots by itself or as part of an assortment of other aquatic plants in larger tubs. They prefer quiet waters and overcrowding; adding a floating ring will keep them together and happy in agitated ponds. They do better in shade, but too little light will make the leaves turn a darker green. In a very sunny location they may have a bleached look. As tropical plants, they need warmth to grow well. Cold winters will kill them. However, they are easily kept indoors near a bright window until warm weather returns. They can be overwintered by planting them in pots filled to the rim with water too. Bottom soil is not necessary for growth, but they require periodic fertilizing to thrive. In the absence of adequate nutrition, many plantlets are produced, but the rosettes remain small. Place them occasionally in a small vessel containing Miracle-Gro to give them a boost. Adding a little potassium nitrate to the water is another option. They do well in koi and goldfish ponds, using up their nitrogenous wastes, but may need to be grown in net baskets if the fish population is too high. Water lettuce adds interesting color and texture to mixed groupings in tubs and ponds. They can be used in fish ponds as they provide food and shelter. The hanging roots offer protection to spawn and smaller fish. They play a role in preventing algal blooms by using up nutrients in the water. Water lettuce is not related to the lettuce used in salads. Young leaves are edible when cooked, but not highly recommended. Bruised fresh leaves can cause itching because of the calcium oxalate crystals present. Yellowing of leaves may result from nutritional deficiency and too much sun exposure. Some water snails and fish feast on the roots and leaves, destroying the plants completely. Their hairy leaves have water repellant capacity, but constant splashing from fountains and waterfalls cause rotting. They provide a haven for mosquito larvae; Mansonia mosquitoes are specially adapted for living in the root system of water lettuce. 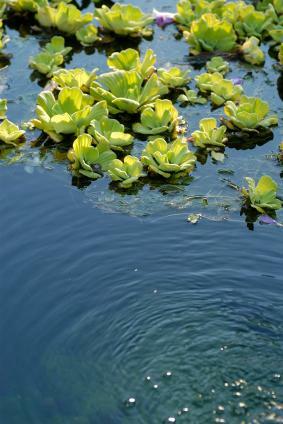 When allowed to grow unchecked, Pistia can crowd out other aquatic plants. The submerged oxygenator plants in the pond may die off from lack of sunlight, and animal life dependent on them may follow suit. Their prolific growth can choke waterways and destabilize natural ecosystems and destroy native plants and animals. Water lettuce is easy to grow and an interesting addition to any garden, but the growth should be kept in check by removing excess plants. Never dispose of them in natural water bodies.